Mr. Alex Greutman began his Kokondo training in the art of Jukido Jujitsu in February of 2004 under the instruction of Sensei Rego. Since the beginning of his training it was clear that Mr. Greutman was destined to become a truly great Kokondo-ka. His love for Jukido and the amount of effort he put (and puts) into each and every workout and technique was an early indication of his ability to achieve excellence as a martial artist. In addition to regular participation in the arts of Jukido Jujitsu and Kokondo Karate at the home Palm Coast dojo, Mr. Greutman is also a regular attendee of the annual International Kokondo Martial Arts seminar, as well as the annual Florida Kokondo Martial Arts Seminar lead by Shihan Paul Arel (founder) and Master Gregory Howard. Mr. Greutman in many ways embodies what is often envisioned in self-defense practice. In real jujitsu, one always assumes that attacker will be physically larger and stronger and that utilizing muscular strength against them is a losing proposition. Jukido students learn the importance of “embracing” this seemingly inferior position by adopting a set of principles and strategies that allow them to use the motion, energy, size, and strength of a larger attacker against them. Mr. Greutman is often physically smaller then his training partners and often “weaker” in terms of physical strength – however, his understanding of real jujitsu allows him to still be the more “powerful” individual – utilizing his physical assets with those of his attacker(s) to create a truly flowing, yet powerful technique. After his evaluation to the rank of black belt – many senior Jukido masters and sensei were impressed by the use of kuzushi (off-balancing; using the motion of a larger attacker against them), including Sensei Paul Ward (4th dan), Master Robert E. Robert (5th dan), and Master Gregory Howard (7th dan). 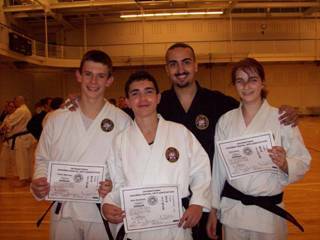 In July 2007, Mr. Greutman (along with Ms. Ellen Scherr and Mr. Vadim Belinskiy), was promoted to the rank of probationary shodan (1st degree black belt) in the art of Jukido Jujitsu at the largest Kokondo function of the year – the International Kokondo Martial Arts seminar. Mr. Gretuman and his peers were only the 2nd group of FJJA members to be promoted to the rank of black belt. Mr. Greutman’s testing for black belt began in December 2006 at the 3rd annual Florida Kokondo Martial Arts Seminar in Palm Coast; under the eyes of Sensei Rego, Sensei Joaquin Betancourt (IKA U.S. National Associate Jukido Director), Master Robert E. Robert (IKA U.S. National Jukido Director), Master Gregory Howard (7th dan, IKA International Associate Director), and Kokondo’s founder Shihan Paul Arel (10th dan and IKA International Director). 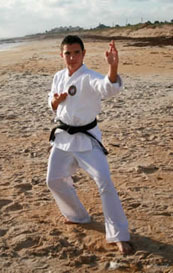 During the 1st half of 2007 Mr. Greutman was tested directly by FJJA Chief Instructor and IKA Florida Supervisor on five occasions – all tests focusing on various areas of self-defense at length. Finally, after over 7 months of black belt evaluations, Mr. Greutman had his final test in July 2007 at the International Kokondo Martial Arts Seminar. At the end of the first evening session, Mr. Greutman was promoted by Sensei George Rego, Master Gregory Howard, and Shihan Paul Arel to the rank of black belt.Around the dojo Mr. Greutman is known for titanic sense of humor and loyalty to Kokondo. His ability to utilize motion for a fast and truly powerful throwing technique are admired and studied around the dojo. His favorite activities include multiple attackers and randori.